Look what came in the mail today! I love reading books on leadership, especially ones that are related to Disney. I am always looking for ideas on how to decrease volunteer turnover, and I think this book will help. 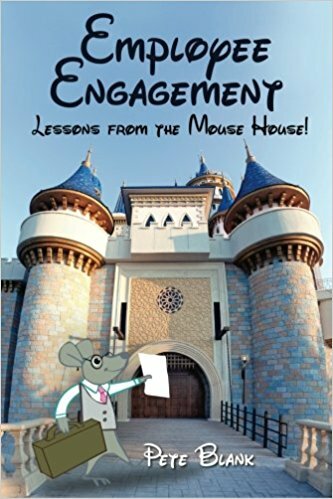 Employee Engagement was written by Pete Blank who was a cast member at Walt Disney World. He shares his knowledge & experiences from working at Disney, specifically on the topic of keeping employees engaged. In the first chapter, he talks about 4 reasons why people work and stay in their jobs. I think the same principles apply to volunteering in kids ministry. They like the job – These people like to do the role they are doing. They are wired to do it and simply love doing what they are doing. Look for people to serve in areas of their passion. If you find the role to fit the person, they will stay serving because they are doing what they love to do. They like the organization – These people believe in the organization. They may volunteer in your church because they believe in it and are willing to do what it takes to see ministry happen. Look for people who have been around for many years. Different stages of life bring about different serving options. Perhaps people who are retired now have time to invest in the next generation. They like the boss – These people are connected to the leader. They like how they lead, the friendship & the overall benefits of interacting with the leader. Connect with people outside of kids ministry. The friends you make will probably want to help you in kids ministry because they have connected with you. They like the people they work with – These people like to be with their team! Volunteers in these roles have a sense of community with the people they serve with. Be intentional about placing people on teams where they can connect. Put young adults with young adults. Put families with young children with families with young children. They will probably have a lot in common and will become friends. Friends like to serve with their friends. If you work on these 4 areas, chances are you will decrease volunteer turnover and your volunteers will stick around. For more information on how to get volunteers to help every week, click here. For more information on how to create volunteer training that people will want to come to, click here.